Every once-in-awhile, I have an idea which will make my life a wee bit easier. 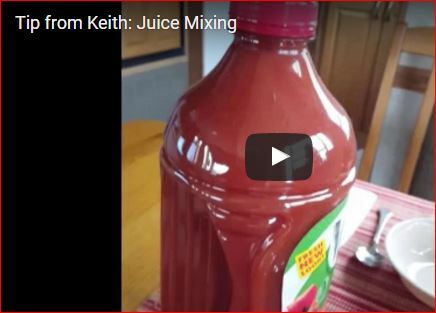 Today, I’m sharing this short video on mixing juice as a Tip from Keith. It has made breakfast with a new bottle of juice easier! Before I tumbled to this idea, mixing juice was more complicated: I poured out half-a-glassful, put the cover back on, shook the bottle, then poured the juice in the glass back into the bottle and shook it again. Both methods work. This one is much easier! If find this Tip from Keith useful, please leave a comment!